Is It Good? Bill & Ted's Most Triumphant Return #1 Review – AiPT! Being a child born in the 80’s, I have a special affinity for Bill and Ted and I’m not ashamed to admit it’s possibly due to my brain not being fully developed when I enjoyed the movies. It’s easy to see the subject matter is silly, juvenile and mostly stupid, but then again, what isn’t even today? The series brought time travel to a level where any kid could imagine going on an adventure and didn’t require you know a thing about history. And so, BOOM! 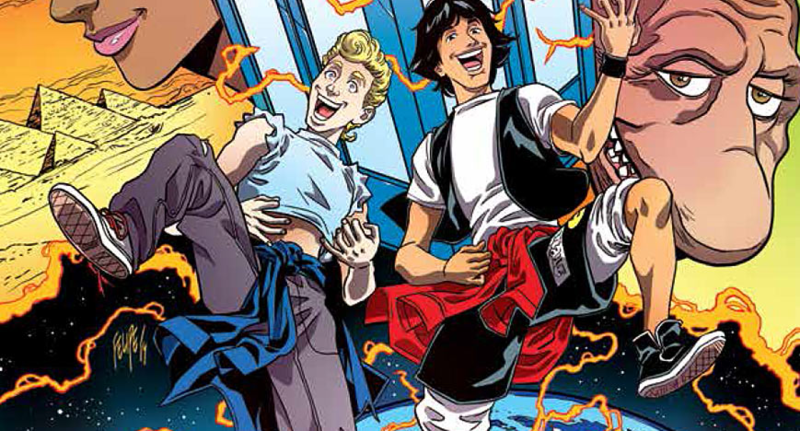 Studios has begun to publish a Bill and Ted comic… but is it good? Written by Brian Lynch with a backup story by Ryan North, issue one takes place right after the second film concluded. Bill and Ted are older, wiser, and have created the greatest rock song of all time. The book quickly brushes their growing older under the rug with a few haircuts by Death, but ultimately it’s rather obvious this isn’t the most serious of series. In fact, I’d peg this more as an animated adventure over anything closer to the films. (Not to say the films were for adults, but the themes and tone of this series is very lighthearted.) The robot Bill and Ted are back, this time as nannies for their kids, but if you’re afraid they’ve gone full adult you’d be wrong — Lynch keeps them silly and stupid like they’ve always been. I can’t say Lynch gets the show on the road fast enough and instead takes his time setting up the plot of their adventure. Obviously this is expected to some extent in a first issue, but many of the pages feel like they could have been condensed down into far fewer. Introductions are minimal as far as characters go so don’t expect to enjoy this much if you haven’t seen the films. That said, we get a brief moment with all of the main characters so nobody is too foreign or dropped in without notice. Once things really get going there’s only 3 or so pages left, but it’s at this point you’ll realize this really is a cartoon and less of a follow up to the films. Some folks might love this, but for longtime fans this may feel a bit too young adult, albeit that’s what the original was made for, but I imagine most fans of this series are now in their 30’s so it might come as a surprise. The art by Jerry Gaylord is quality stuff and similar to what you’d expect from the Cartoon Network books BOOM! has been publishing. The colors are very bright and the style simple and expressive. I particularly like how he’s rendered the Robot Bill and Ted as they’re just as creepy as they were in the films but still comical and fun. The setting could use a bit more detail, though — at times as it’s hard to spatially understand where they are. This isn’t always the case, but a minor issue I noticed that takes you out of the book a bit. Certain rooms are completely blank and one solid color, which give no sense of location nor how much room they even have. It tends to give things a bit of a claustrophobic feel. The backup written by Ryan North and drawn by Ian McGinty is quite fun and filled with the two’s customary humor. North and McGinty continue to use the small text at the bottom or side of the page they’ve used with Squirrel Girl and other books to allow the narrator/author a chance to comment on what’s going on, which is always safe for a good laugh. The main thrust of this story is about the Robot Bill and Ted and how they’ve downloaded a virus. What would they possibly do? How about go to the year 2015 and have themselves fixed! It all works out in the end of course and done so with humorous surprises and plenty of waxing on and off from Bill and Ted. Though only the first issue, I think it’s safe to say North fills the panels with great Bill and Ted dialogue and outdoes the main story from Lynch. Death even makes it into this one! The main story takes a while to kick into gear and isn’t funny or fun enough to pull its own weight, but the backup by Ryan North more than saves the issue with a perfect rendition of the best buds on an excellent adventure.